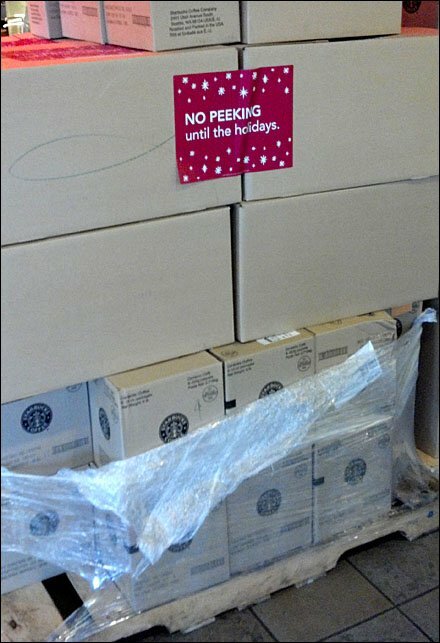 Was this No Peeking Until the Holidays direct instructions to the store staff, or a teaser to passing shoppers. All the more curious, it was seen at a Starbucks in center store. What, pray tell, could Starbucks be hiding until Christmas? It piqued my interest enough for a photo and comment. If you know the Holiday secret, post it here for us all. And yes, Hospitality and Food Retailing are covered editorially by the mainstream retail design magazines, why not FixturesCloseUp? I think my coverage is more unique and trendy to boot. What say you?